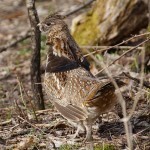 The ruffed grouse is an upland game bird with many common names, including partridge. Resembling a chicken in shape, it is exceptionally well-camouflaged, with speckled plumage that ranges in color from gray to a rich red. It has a dark-colored ruff around the neck, especially noticeable in male birds. The tail has a black band. Preferred habitat includes brushy woodlands with poplars, birch and alders, where the grouse feed on buds, berries and insects. 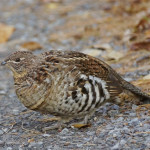 Although ruffed grouse spend most of their time on the ground, they’re skilled short-distance fliers and are able to navigate between trees at high speeds. The male grouse has a fascinating spring mating behavior called “drumming.” It finds a staging spot, such as a stump or large rock. There, it begins to slowly beat its wings, building up speed and ending in a rapid whir. This creates a low-pitched thumping, reminiscent of an old-time engine slowly warming up. The sound is produced because a vacuum is created when the wings are drawn outward. As air rushes in to fill the void, it produces a thump. Drumming serves to attract females, as well as defend the male’s territory. Ruffed grouse don’t migrate. By winter, they have grown rows of tiny extensions on their toes that biologists believe act as snowshoes.